An Invitation from Midcoast Printmakers, Inc.
Come to the Printmaking Studio at Round Top Farm/DRA in Damariscotta on Sunday, March 10, to see how original prints are created. The print shop staff is made up of professional artists who teach a variety of classes and workshops. See the website www.midcoastprintmakers.com for class descriptions. Please join us on Sunday, March 10 from 1-3 p.m. for dessert, conversation, possible demonstration and view new work. Contact Frances Hodsdon at 549-7087 for more information. Valentine’s Day was a little more special for members of Holly Berry’s Linocut class when five members of the Nor’easters Barbershop Chorus appeared at the Studio door on the DRA/Roundtop Farm. They were each presented with a long-stemmed red rose after being serenaded with a singing Valentine. The third national juried monotype exhibition will open at The Barrington Center for the Arts at Gordon College in Wenham Massachusetts February 23. The juror for show is Mark Pascale, Curator in the Department of Prints and Drawings at the Art Institute of Chicago. An awards ceremony is slated for March 2, 3:30 until 5:30. The exhibition will be on view until April 6. The show was organized by the Monotype Guild of New England whose mission it to promote the unique hand print. 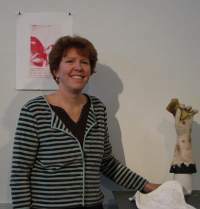 Debra is an instructor at the Midcoast Printmakers in Damariscotta.